The nucleus is a small spherical, dense body in a cell. It is often called the "control center" because it controls all the activities of the cell including cell reproduction, and heredity. How does it do this? Chromosomes, found in the nucleus, are microscopic, threadlike strands composed of the chemical DNA (short for deoxyribonucleic acid). In simple terms, DNA controls the production of proteins within the cell. These proteins in turn, form the structural units of cells and control all chemical processes within the cell. Chromosomes are composed of genes. A gene is a segment of DNA that codes for a particular protein, which in turn codes for a trait. Hence you hear it commonly referred to as the gene for baldness or the gene for blue eyes. Meanwhile, DNA is the chemical that genes and chromosomes are made of. It stands for deoxyribonucleic acid. DNA is called a nucleic acid because it was first found in the nucleus. We now know that DNA is also found in organelles, the mitochondria and chloroplasts, though it is the DNA in the nucleus that actually controls the cell's workings. In 1953, James Watson and Francis Crick established the structure of DNA. The structure is a double helix, which is like a twisted ladder. The sides of the ladder are made of alternating sugar and phosphate molecules. The sugar is deoxyribose. Color all the phosphates pink (one is labeled with a "p"). Color all the deoxyriboses (D) blue. The rungs of the ladder are pairs of 4 types of nitrogen bases. Two of the bases are purines - adenine and guanine. The pyrimidines are thymine and cytosine. The bases are known by their coded letters A, G, T, C. These bases always bond in a certain way. Adenine will only bond to thymine. Guanine will only bond with cytosine. This is known as the Base-Pair Rule. 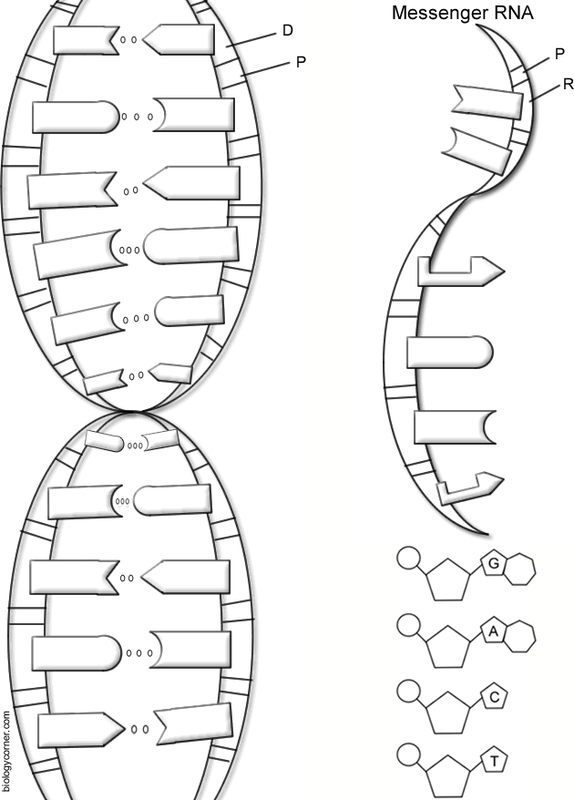 The bases can occur in any order along a strand of DNA. 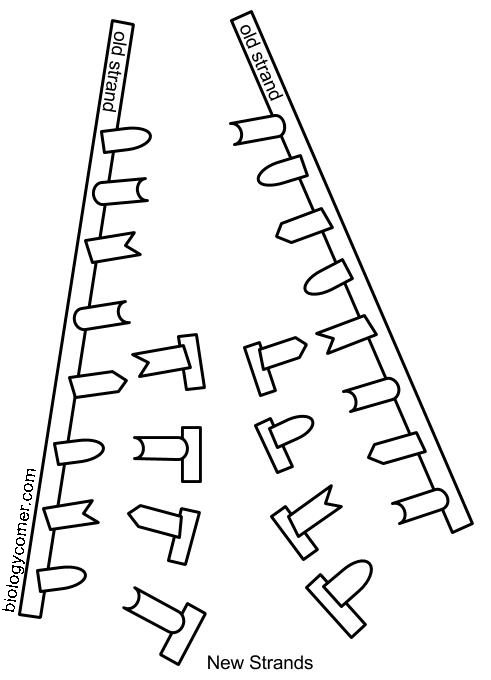 The order of these bases is the code the contains the instructions. For instance ATGCACATA would code for a different gene than AATTACGGA. A strand of DNA contains millions of bases. (For simplicity, the image only contains a few.) Note that the bases attach to the sides of the ladder at the sugars and not the phosphate. thymine = orange. adenine = green. guanine = purple. cytosines =yellow. The combination of a single base, a deoxyribose sugar, and a phosphate make up a nucleotide. DNA is actually a molecule of repeating nucleotides. Examine the nucleotides closer. Two of the bases are purines - adenine and guanine. The pyrimidines are thymine and cytosine. Note that the pyrimidines are single ringed and the purines are double ringed. Color the nucleotides using the same colors as you colored them in the double helix. The two sides of the DNA ladder are held together loosely by hydrogen bonds. Color the hydrogen bonds gray. So, now, we know the nucleus controls the cell's activities through the chemical DNA, but how? It is the sequence of bases that determine which protein is to be made. The sequence is like a code that we can now interpret. The sequence determines which proteins are made and the proteins determine which activities will be performed. And that is how the nucleus is the control center of the cell. The only problem is that the DNA is too big to go through the nuclear pores. So a chemical is used to to read the DNA in the nucleus. That chemical is messenger RNA. The messenger RNA (mRNA) is small enough to go through the nuclear pores. It takes the "message" of the DNA to the ribosomes and "tells them" what proteins are to be made. Recall that proteins are the body's building blocks. Imagine that the code taken to the ribosomes is telling the ribosome what is needed - like a recipe. Messenger RNA is similar to DNA, except that it is a single strand, and it has no thymine. Instead of thymine, mRNA contains the base Uracil. In addition to that difference, mRNA has the sugar ribose instead of deoxyribose. RNA stands for Ribonucleic Acid. Color the mRNA as you did the DNA. Color the ribose a DARKER BLUE, and the uracil brown. Every cell in your body has the same "blueprint" or the same DNA. Like the blueprints of a house tell the builders how to construct a house, the DNA "blueprint" tells the cell how to build the organism. Yet, how can a heart be so different from a brain if all the cells contain the same instructions? Although much work remains in genetics, it has become apparent that a cell has the ability to turn off most genes and only work with the genes necessary to do a job. To build the body, the code carried on messenger RNA travels to the ribosomes where three bases within the code (called a codon) specify a single amino acid. A long mRNA chain could contain thousands of these amino acids. When linked together, the amino acids form proteins, which make up many structures in the body. In this section, color the bases and RNA chain the same as you did previously. Color the amino acids red. Each time a new cell is made, the cell must receive an exact copy of the parent cell DNA. The new cells then receive the instructions and information needed to function. The process of copying DNA is called replication. Replication occurs in a unique way – instead of copying a complete new strand of DNA, the process “saves” or conserves one of the original strand. For this reason, replication is called semi-conservative. When the DNA is ready to copy, the molecule “unzips” itself and new nucleotides are added to each side. The image showing replication is similar to the DNA and mRNA coloring. Note the nucleotides are shown as 2 parts – the sugar and phosphate (color blue) and one of the four bases identified by shape, color the same as you did on the other model. 19. How do some cells become brain cells and others become skin cells, when the DNA in ALL the cells is exactly the same. In other words, if the instructions are exactly the same, how does one cell become a brain cell and another a skin cell? 20. Why is DNA called the "Blueprint of Life"?